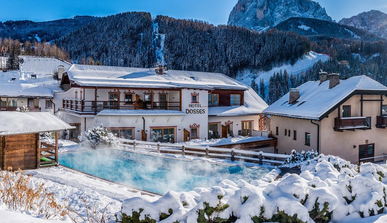 The Val Gardena is a true paradise for all winter athletes. Countless ski slopes, cross-country ski runs, après-ski bars and much more is offered in this fascinating valley. 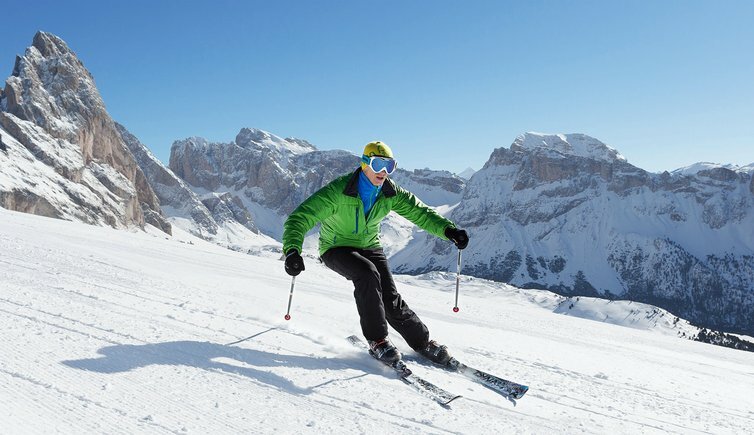 What about spending a day on the slopes of the world-famous Sella Ronda? 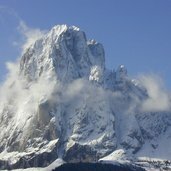 The Gruppo del Sassolungo, a mountain range in western Dolomites, is situated between Val Gardena, Val di Fassa, Alpe di Siusi and Catinaccio mountain range. 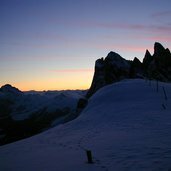 If you get up very early in the morning you can admire the fabulous natural spectactle of a runrise in Val Gardena mountains. 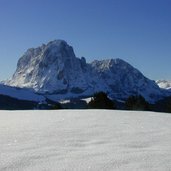 Val Gardena mountains in their winter outfit. 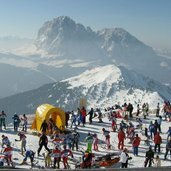 Every year on Col Raiser in Valgardena, there is the longest giant slalom of the Dolomites, called "Gardenissima". Not only in winter mountains are leading actors in Val Gardena. 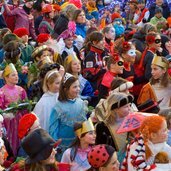 Carnevale in Val Gardena, fascinating both for adults and children. 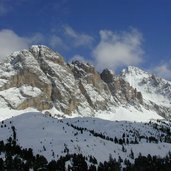 Sassolungo and Sassopiatto in winter. 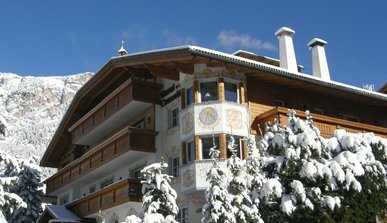 Filigree snow sculptures decorate the centres of Val Gardena villages. 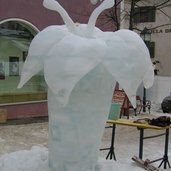 These pieces of arte are created in the International Snow Sculpture Festival. 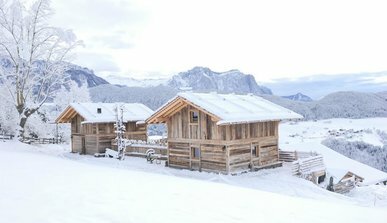 A snow-covered farm in Val Gardena. In the background Gruppo del Sassolungo. 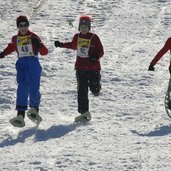 Snowshoeing… apparently also kids love this sports. The winter pleasure is starting on our door step – enjoy perfect holidays. After a day out in the fresh winter air, sit down here on our terrace, sip on a steaming cup of herbal tea, and allow the last rays of sunshine to work wonders on your very soul. 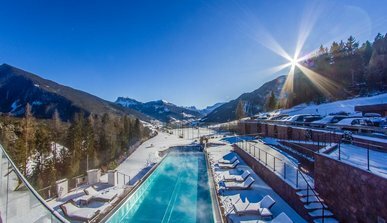 Val Gardena is a genuine Eldorado for all who love winter sports – in your winter holidays at our Hotel you will all get your money’s worth. 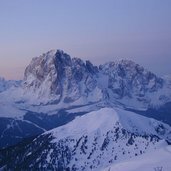 Winter is a magical season in Val Gardena: a blanket of snow covers the valley and the majestic Dolomite peaks, turning the area into one of the top skiing and winter sports destinations in Europe. 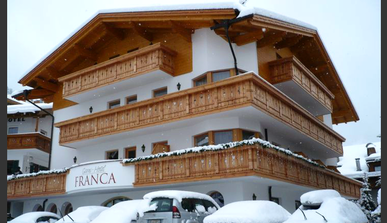 Feeling at home while enjoying true South Tyrolean hospitality… this is waiting for you at our family-run and comfortable „Garni Hotel Franca“ in Selva Val Gardena. 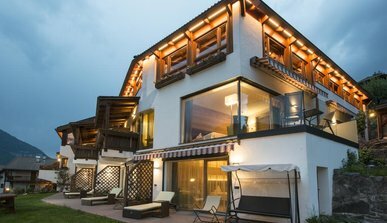 With its unsullied natural landscapes and quaint charm, the Val Gardena valley is a real paradise for active holidaymakers and nature lovers. 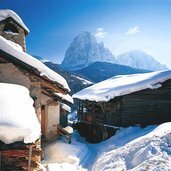 Val Gardena in the Dolomites is a winter paradise and with no doubt one of the European most beautiful skiing district. 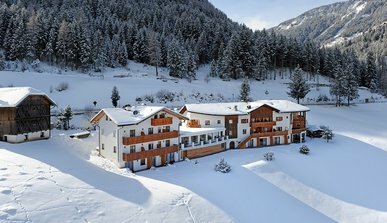 Enjoy your winter holiday at the foot of the picturesque Dolomites, near the Val Gardena ski resort with a connection to the famous Sella Ronda!